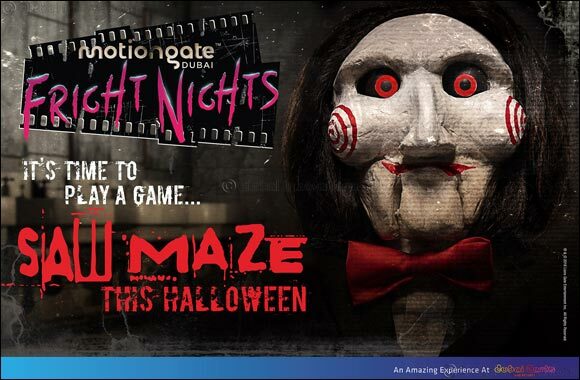 Dubai, 20 October 2018: MOTIONGATE™ Dubai, the region's largest Hollywood-inspired theme park, is the go-to destination this October for Halloween. The park will transform into a ghoulish paradise after dark, with its 2 zombies scare zones and all new SAW Maze every weekend from 18th of October to 3rd of November. Debuting for the very first time in the UAE and the region, the true-to-film SAW Maze brings to life the terrifying tests and iconic traps from Lionsgate and Twisted Pictures' blockbuster SAW films, one of the most successful horror franchises ever, grossing nearly $1 Billion at the worldwide box office. Guests must be 16 years of age or older to enter the maze alone and or a minimum of 14 years with an accompanying parent. In addition to the first-of-its-kind SAW Maze in the Region, the park will have two scare zones in the Lionsgate and Columbia areas where guests can encounter their favourite zombies or monsters in person. For a truly eerie experience, park opening hours will be extended during Fright nights from 7 to 11 PM. So that kids don't miss out on all the fun, child-friendly Spooktacular Halloween festivities will be held at Hotel Transylvania during the day. Kids can meet and greet their favorite characters from Hotel Transylvania, including Drac, Mavis, Murry and Co in the Columbia Zone and families can participate in trick or treating, face painting, storytelling and pumpkin crafts. Kids can also come dressed in their favorite Halloween costumes and go trick or treating at the Hotel Transylvania castle and Smurfs Village. Tickets are available online for AED 175 only for UAE residents and AED 245 for non-residents. Entrance to the SAW maze, as well as the scare zones are all included in the park ticket. Brace yourself for two weeks of nightmarish horror, where you will find some of the most grisly monsters, zombies and ghouls walking the streets after dark. This is not for the faint hearted!